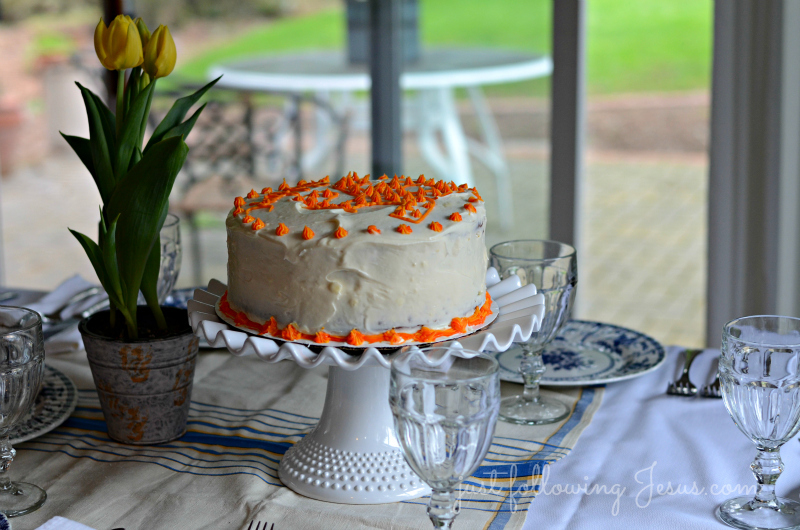 Just following Jesus in my real life...: Friday's Favs...I'm lovin' Carrot Cake with Cream Cheese Frosting! 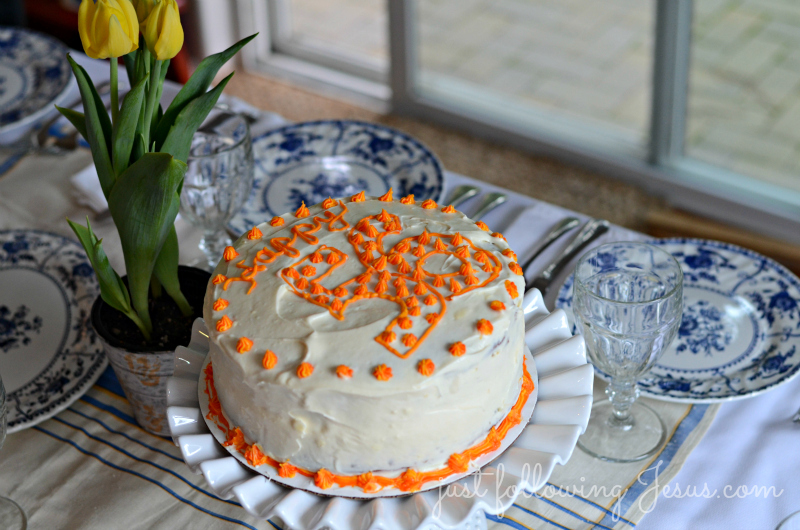 Friday's Favs...I'm lovin' Carrot Cake with Cream Cheese Frosting! The Hubs had a birthday this week! and he enjoyed a wee sliver of cake with some sugar free ice cream. All the family came over for a roast beef birthday dinner and they enjoyed Papa's cake, too. The recipe is one I've had for years. It is supposed to be the recipe for the Cracker Barrel restaurant's carrot cake. The batter has carrots, coconut, crushed pineapple, walnuts and raisins in it. 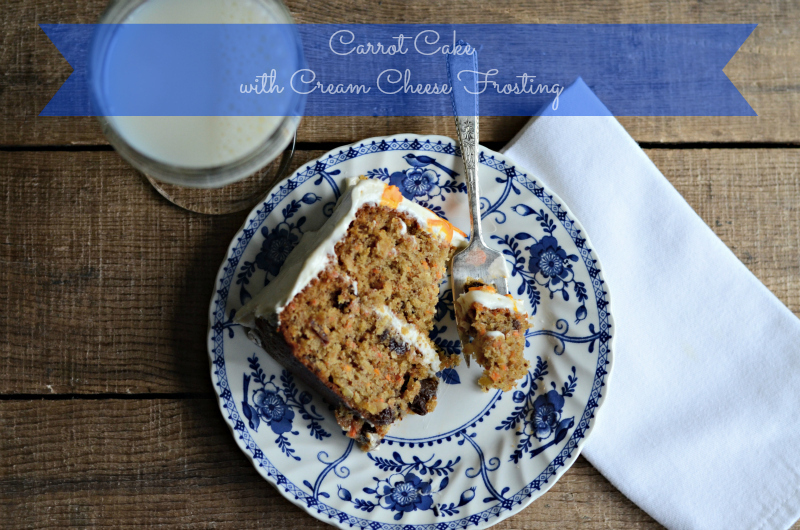 It's dense and moist and delicious...everything a carrot cake should be. 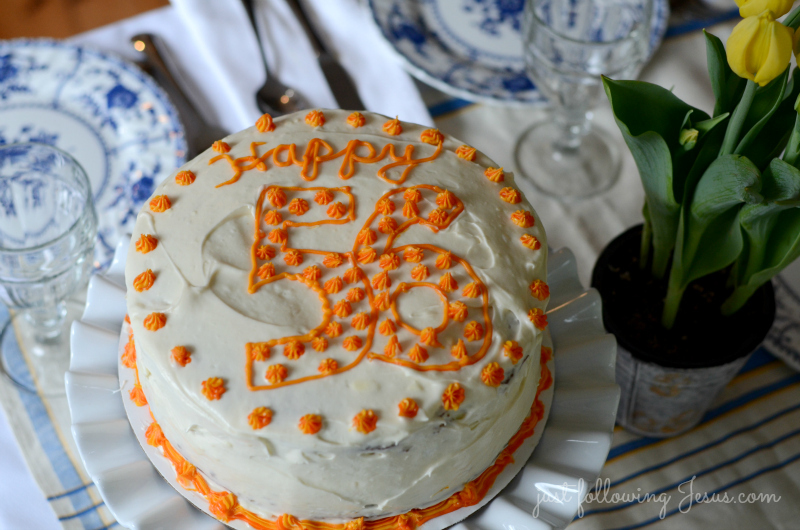 Of course carrot cake must be topped with delicious cream cheese frosting! I was afraid a single batch wouldn't be enough so I made a double batch of frosting. There's a lot left over...looks like I'll be making the grandkids some cupcakes soon! I also made a whole batch and another half batch of the carrot cake recipe. I wanted the nine inch cake pans to be nice and full. It made enough for a small loaf pan cake as well as two nicely full nine inch rounds. You can see that the cake is nice and tall in the photos below. 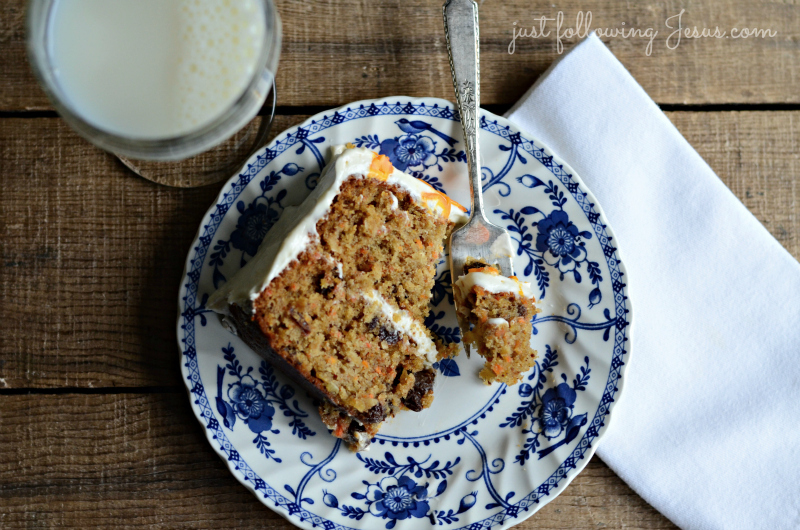 If you are a carrot cake fan, I hope you give this recipe a try! Here is the original single batch recipe. In mixer bowl beat oil, sugars, vanilla and eggs until smooth and fluffy. 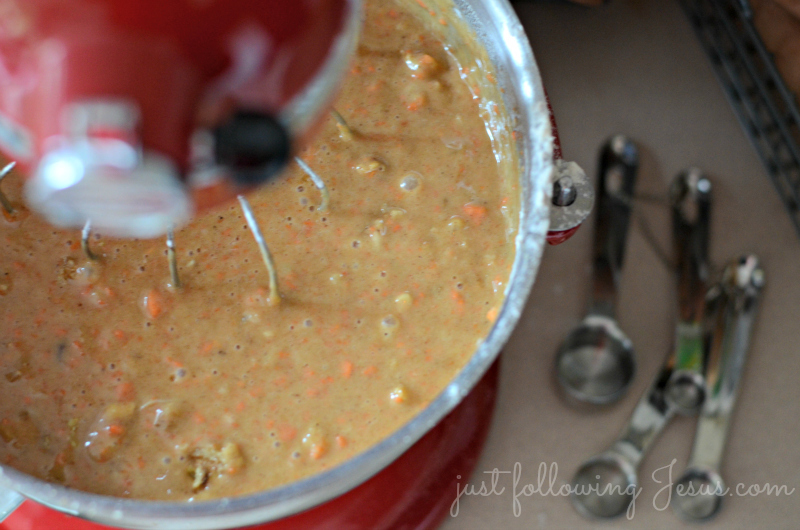 Add pineapple, walnuts, coconut, carrots and raisins and blend well. Add dry ingredients and mix until blended well. Pour into a greased and floured 9x13 pan or 2 - 8 or 9 inch round pans. Bake at 350 for 40-50 minutes or until toothpick inserted into center comes out clean. 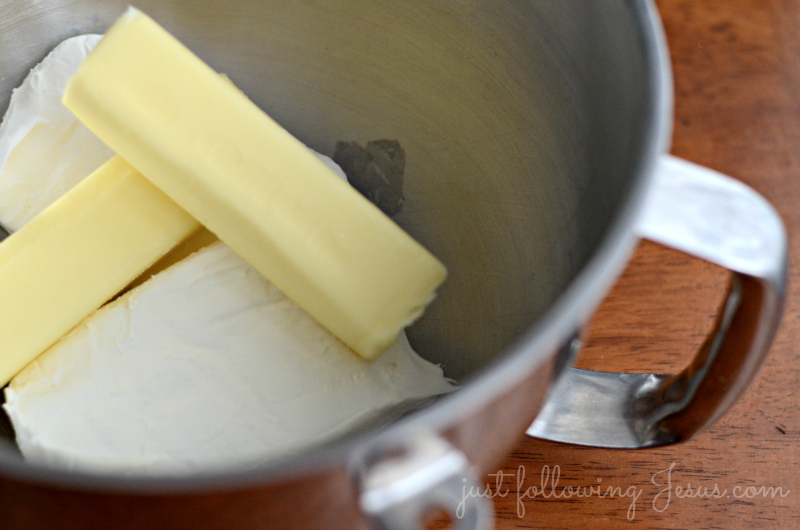 Soften cream cheese and butter until room temperature. Add vanilla and powdered sugar a little at a time until frosting is light and fluffy. ... and YES to double the frosting! Oh my goodness, what I would give for a piece of carrot cake right now! What a yummy one you made your hubby! Thanks for the very sweet comments on my blog this week! I love a good carrot cake.. I use pineapple in mine..I am not a fan of cream cheese icing except on carrot cake.. love it! Happy B-day to your hubby. Blessings! Carrot cake is my very favorite dessert. I stand with Israel too!!!!! By the way, this is my first visit to your blog. And, I'll be back for sure. I made two of these in the last month for birthday requests. It's one of my favorite cakes. Your photo of it makes me want another piece! What a beautiful cake. I'm a juicer. 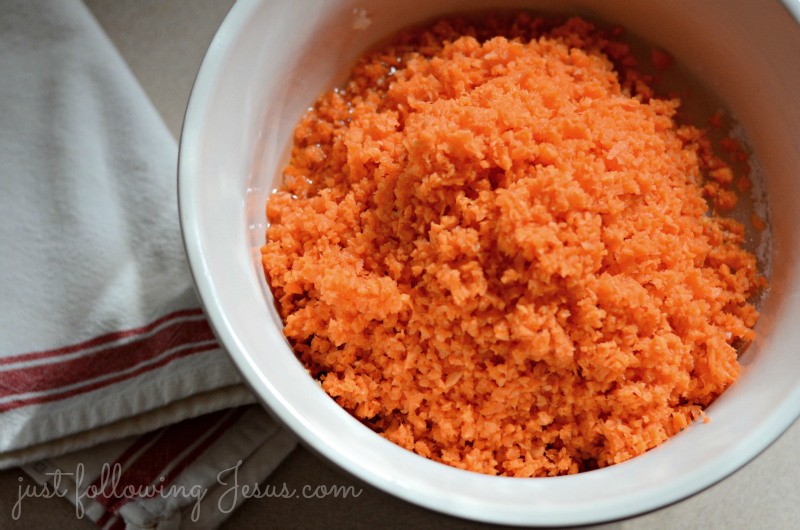 Every morning when I add the carrots to the juicer and see that pulp get pushed into the waste container, I think, "man, I should make carrot cake." but, that what defeat the whole purpose of juicing, wouldn't it. Not a good idea to read this post right before going to bed!! I am not going to be able to sleep thinking about that yummy carrot cake. Hope Pastor had a good day!! Anyway, HAPPY BIRTHDAY to your husband! My DIL said she was going to make a carrot cake for my birthday. This is decorated so prettily. Looks delish and your decorating is so sweet! I bet every bite was loved! Hope you can stop by the enchanted oven. Oh yes,, carrot cake is our favorite around here.. I only bake it when I know family or friends are here to eat it up..because I could eat the whole CAKE..